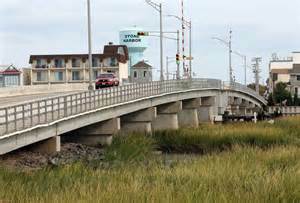 On Tuesday, October 9th and Wednesday, October 10th Cape May County Engineering consultants will be performing NJDOT mandated safety tests on the 96th Street Bridge (CR 657) and the Ocean Drive Bridge (CR 619). These tests will require complete closure of the bridge to all vehicles and marine traffic for 15 minute intervals over a four (4) hour period from 9am to 1pm. In addition, inspectors will also be at these locations on October 11th and October 12th performing other testing which may require brief bridge openings.